Early twentieth-century boosters for the state of Arkansas liked to brag that theirs was the only state in the union around which a wall could be built without detrimentally affecting its citizens. After all, Arkansas had natural water resources, plentiful farmland, lots of standing timber, coal in the west, oil in the south, and mineral deposits in its hills. Of course, the claim was greatly exaggerated. Not only do other states have such resources, but Arkansas’s were by no means sufficient to maintain its population in a twentieth-century lifestyle—the coal had largely played out by the New Deal, and the lead and zinc in the Ozark hills were never enough to warrant significant investment. In addition, these boosters had completely overlooked the state’s dependence upon imported iron—the basis of all the equipment (plows and saws) and the railroads that helped to drive Arkansas’s economy. Of course, the image of a walled-in Arkansas was less a statement of independence and more the claim of a good environment for investment. However, recent years have witnesses a push for the kind of self-sufficiency imagined by those old boosters, especially as embodied in “localism,” or the belief that small-scale ventures—small businesses, farmers’ markets, regional arts and crafts—offer both a sustainable alternative to globalization and a means of recapturing lost community values. Bestselling books such as Barbara Kingsolver’s Animal, Vegetable, Miracle: A Year of Food Life (2007) typify the movement, encouraging readers to embrace the chores of growing and cooking their own food, or at least ensuring that most of what they eat comes from within a narrow radius. Not only does this discipline promote community, she argues, it also strikes against the commodification of food and the degradation of the environment. Or does it? In No Local, Greg Sharzer places the claims of localism to the test, finding that “hidden beneath localism’s DIY attitude is a deep pessimism: it assumes we can’t make large-scale, collective social change” (3). While the movement toward small-scale economies might deserve praise for its community-centered, humanistic worldview, as well as for identifying the problems with the current regime of neoliberalism, Sharzer argues that localism proceeds from a fundamental confusion about the nature of the capitalist economy, and this confusion undermines the ability of the movement to offer any real palliative to the current system, much less a viable alternative. For starters, localists, emphasizing fairer wages for workers, see the small business as embodying a less tainted version of capitalism than the national chain store, ignoring the fact that both participate in a wage system that is inherently unfair: “Even if workers received the full value of what they produced, they’d still be paid in capital taken from other workers…. The theft of value comes before the market” (11). Moreover, money spent in locally based markets only remains in the area if the means of production are located there—small businesses sell the same imported merchandise as do the large chains, and while farmers’ markets offer truly local goods, those goods still depend upon oil and specialty tools, meaning that local dollars quickly circulate away. Besides, such trends as “ethical consumption” ignore the nature of exploitation in capitalism and instead “shift blame onto individual consumers for the failings of the system: if there’s alienation and environmental misery, it’s your fault for buying the wrong things” (37). Sharzer devotes an entire chapter to localized agriculture. He begins by recalling the enclosure of common lands in England and the application of industrial principles to the growth of food. As a result of these capitalist transformations of the land, “not only did agriculture become a separate branch of industry, [but also] the whole concept of countryside and city came into being: the rural became sparsely populated and the urban concentrated,” leading the remaining farmers to grow exclusively for these new markets (59). Though small farms continue to exist, these are often controlled indirectly by the banks to which they are indebted. Debt and rent force innovation and growth, leading those who perhaps sought an alternative to capitalism to replicate it for their own preservation. Of course, small-scale agriculture can provide certain benefits (e.g., space for animal habitats), but attempts to commodify these services, such as having governments reimburse landowners for them, “would lead to massive estates of landowners who could speculate on the new values of their land” (74). While Sharzer acknowledges great potential in agro-ecology, he notes that it is unlikely to emerge as a viable alternative until its practitioners direct confront the power of capital. According to Sharzer localism encompasses not a strategy of actual resistance, but an ideology—specifically, one rooted in the experience of the petite bourgeoisie, who, because they operate at the margins of the capital-labor relationship, “can see the symptoms of capitalist growth but not the causes” (89). For the petite bourgeoisie, voluntary choices are the key to social change, and these voluntary choices form part of the habitus of this particular class: “When localism substitutes ethical consumption for politics, this isn’t an error: it’s an ideological reflection of how the petite bourgeoisie structure their lives” (92). The community connections destroyed by capitalism are seemingly rebuilt through smaller-scale capitalism, with farmers’ markets offering more than just simple transactions, but rather that lost filial relationship. Sharzer finds in the localist project a modern utopianism gazing blissfully upon, and seeking to recreate, pre-capitalist economies, combined with a sense of immanent catastrophe—Peak Oil, global warming—that espouses a radically conservative view of human nature as being consistently prone to the wrong choices. In fact, localism is not necessarily opposed to neoliberalism: “By promoting local solutions to a global system, the centers of power remain free to impose market discipline: this, paradoxically, ensures a continuing need for localism. Localism can be a strategy of neoliberalism” (138). Indeed, major grocery store chains now offer locally grown produce, thus fabricating an ethical appearance that obscures the capitalist drive for exploitation. In The Eighteenth Brumaire of Louis Bonaparte, Karl Marx denounced the kind of movement which surrenders “the task of revolutionizing the old world with its own large collective weapons and, on the contrary, seeks to bring about its emancipation, behind the back of society, in private ways, within the narrow bounds of its own class conditions, and, consequently, inevitably fails.” These words easily apply to localism as Sharzer finds it, though he acknowledges that the local can serve as a site of struggle against capital. But what if one sought to combine localist economies with a small-scale political structure, thus avoiding the split between economics and politics that is a part of bourgeois ideology? In other words, what if one sought to create a small-scale model of the nation-state based upon ecological principles? Could such a system offer a real alternative to the degradation advanced by capitalism? Such a system is that proposed by Catalan author Ignasi Ribó in Habitat: The Ecopolitical Nation. Just as localists find salvation in the small business and farm, Ribó finds hope in the breakup of large Western states, in the independence movements of Catalonia, Scotland, Quebec, and others—specifically, hope for the emergence of a new political and economic order, the habitat-nation. Ribó defines the habitat-nation as “the community of individuals (inhabitants) who share a way of being, due to the confluence of genetically and socially acquired dispositions (habits), as well as the set of strategies, practices and institutions (forms of habitation) that allow them to adapt to (inhabit) a given natural environment (habitat) in a sustainable manner, thanks to the bonds of autonomy, reciprocity and friendship” (8). Ribó spends four chapters fleshing out this definition. The first of these chapters treats human beings, whose habits lie at the confluence of the genetic and social transformation of information, rather than being defined by either nature or nurture. After surveying recent studies of altruism and reciprocity, Ribó concludes that “the interest of individuals and the interest of the group appear thus to be interlaced in a complex social system that has evolved genetically and culturally through hundreds of thousands of years and has never been without conflicts or tensions,” though human cooperation tends to be stronger within kin groups and other close associations (27). Regarding humans as a part of the environment, rather than separate from it, Ribó maintains that “human habitation has been generally sustainable where there has been a long process of coadaptation between the human population and the biological community,” while migrating populations have typically “been the cause of severe environmental damage, in so far as the populations that settle outside their traditional habitat not only exert an added pressure on the available resources, but they usually lack the institutions and social practices that are required for a sustainable interaction with their new ecosystem” (40-1). Understanding humankind as intricately tied to its various environments necessitates moving beyond an abstract, limiting definition of citizenship as entailing only rights and responsibilities and, instead, going back to Aristotle’s focus upon philia (friendship) as crucial to political projects, thereby making the polis “a voluntary and ongoing relationship of reciprocity between the members of the community” (50). The liberal notion of citizenship, paired with the rigidity of representative democracy, tends to turn citizens into consumers and politicians into producers,” with the modern citizen having “as much power as the buyer of yoghurt; he can choose the brand, but not much else” (58). Given that human beings are shaped by—and adapted to—their immediate, lived-in environment, and that large states fail to make manifest the quality of philia that produces more harmonious interaction, Ribó proposes an alternative to the current state system, the habitat-nation, being a smaller polity generally encompassing people who share the same culture and inhabit the same ecological region: “Only by redefining the nation as an inclusive and shared habitat can we hope to overcome the narrow boundaries of humanism and leave behind the conception of the earth and other living being as resources for our unlimited appropriation” (85-6). The habitat-nation does not rest upon a foundation of abstract principles or even the abstract shared identification with a state, but rather “recognises and incorporates the natural conditions, habits and habitation, that already bind individuals in effective communities of inhabitants, even if they are not yet political” (106). The smaller state of people who share habits fosters a greater sense of friendship, and therefore trust, among inhabitants, leading to a more legitimate political system. Ribó’s habitat-nation is not a walled-off domain like the hypothetical Arkansas mentioned above. For starters, he recognizes trade as a form of sociability and of economic importance, with roots in the prehistoric past. Second, he envisions the habitat-nation as founded upon certain ecoliberal principles of justice of the kind a community might fashion were John Rawls’s original position expanded beyond homo sapiens, producing four constitutional orders: 1) “a political order, characterised by the habit of friendship,” 2) “a social order, characterised by the habit of reciprocity,” 3) “an individual order, characterised by the habit of autonomy,” and 4) “a vital order, characterised by the habit of life” (124-5). The common good of all four of these orders thus produces sustainability of cohabitation as a principle of justice by ensuring a relative equality in the access to vital opportunities. 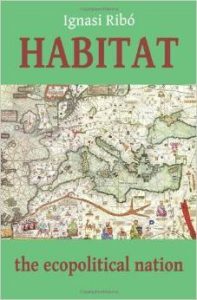 Unlike universalist visions, Ribó argues that the habitat-nation “is not grounded on the abstract notion of moral personality, but on the realities of habitation and the ties that bind the inhabitants” to each other and their shared environment (218). So does Ribó’s ecopolitical vision answer Sharzer’s criticisms of localism? Ribó certainly goes where few localists would dare to venture. Because, as Sharzer rather expertly explains, localism is primarily an ideology of personal salvation, most of its practitioners emphasize individual, economic action without real expectation of changing the world at large. Contrary to this focus upon the individual as the site of social transformation, Ribó engages the world, delving into the realm of politics. Granted, he does not flesh out the exact operations of democracy within the habitat-nation, how such universal democracy might be instituted across an array of individual ecopolitical units, or whether each such unit might possess its own variation upon democracy. However, Ribó does take seriously the necessity of transforming the political order and recognizes that ecological sustainability cannot be truly achieved by the aggregate of individual choices but must entail an expansion of our concept of democracy. Habitat is the sort of work that has fallen out of favour these days—an imaginative prescription for creating the best of all possible worlds. In addition, Ribó manages to propose a sense of community that expands beyond the boundaries of the homo sapiens species without resorting to the mysticism of bioregionalists or Gaia hypothesis adherents. However, there is a distinct pessimism to the ecopolitical vision. It recalls the Tower of Babel—the belief that people must be prevented from forming unions of any significant size. Much of this stems from Ribó’s attempts to avoid the pitfalls of both liberal and communitarian schemas, to try to mark out a “third way,” as it were. But this means that he treats the issue of class as the outcome of larger, imperial systems rather than the force that has driven the expansion he critiques. All the world over, inequality at home preceded, and made possible, violent expansion abroad. This raises another point—namely, the issue of conflict between states. As Laura Westra noted in Human Rights: The Commons and the Collective (2011), while democracy works to give voice to all citizens, the citizens of two countries in conflict cannot solve their problems democratically, as the rule of each government stops at the borders. Can a more locally oriented system of governance, such as the habitat-nation, perhaps only be preserved paradoxically within a more cosmopolitan democratic framework? Though Sharzer sets himself against localism as an ideology, he does tout the local as a viable site of resistance. (It is rather unfortunate that his book is titled No Local, though one rather suspects this is meant as a play on Naomi Klein’s No Logo.) 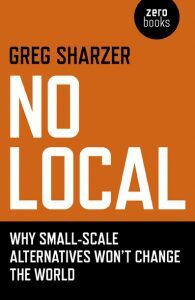 As Sharzer notes at the end of his book, “there is nothing anti-local about socialism. We can confront global institutions of capitalist power in local spaces: when anti-capitalists take on local and community struggles, they’re educating themselves and others about how to resist capitalism on the ground” (166). Indeed, given the capitalist imperative toward greater and greater expansion, only anti-capitalist action can preserve local environments and cultures, perhaps one day giving rise to the philiocracy that is Ribó’s habitat-nation. Not only is the world as a whole a fine place and worth fighting for, but so are our own little corners of it. Sharzer seems to be preoccupied with a Leninist style seizure of state power in one or a number of nation states. That this seizure of power is more or less guaranteed to fail to deliver either direct (i.e. genuine) democracy or socialism has not occurred to him. The revival of democratic and socialist ideas and their realization in practice must begin in local communities because larger scale socialist and social democratic institutions (political parties, trade unions) have failed to operate in a robustly democratic fashion and have seen their limited powers and influence progressively eroded over the past 4 decades. Indeed. Its about contradiction – yes people involved in something like Transition Towns have a range of utopian ideas – that local is better, they romanticise growing food and the agricultural past. But they also understand there is a system that dominates us, more or less called capitalism, and while we are relatively powerless, we need to do something to change it and so connecting up with others and working together to change food and energy systems is something we need to build on rather than denounce. The two books give one the feeling that the West is unable to find ways to overcome capitalism — a system that it had invented and imposed on itself and the rest of the world. One thing is certain, however, that with China and India having failed to provide any viable alternatives to capitalism, Europe alone will have to take the lead and push humankind out of the mire. But it is hard to imagine what will push Europe to the next, truly post-capitalist, phase of human history. Concrete images/models of the post-capitalist world must begin to form and widely disseminate before people can be persuaded and mobilised to realise them in practice. Indeed, endless violence is being done to both humans and nature by capitalism described by Mahatma Gandhi as Satanic. I may have inadvertently given the wrong impression of Sharzer’s work. He does not advocate for a Leninist takeover of state machinery; indeed, in his final chapter, he gives several examples of anti-capitalist campaigns carried out on the local level. However, he does distinguish between localism as an ideology and the local as a site of resistance. Localism, as he finds it, is about imagining a better version of the world we already have than a different world altogether. Friendly capitalism rather than anti-capitalism. This was a challenging book for me. I’ve got a backyard full of edible greens and fruit trees and have been somewhat involved in the local food movement where I live. He does not dismiss this sort of work but rather insists that it be carried out with the intention to transform society rather than as a palliative for the individual conscience. If you begin with the notion of transforming the present society to the extent that its boundaries somehow conveniently correspond with those of a particular nation state or if you are more ambitious and conceive of a proletarian revolution that aims to transform and integrate all human societies you will, in pursuing this project, inevitably subordinate and ultimately extinguish direct or real democratic practices and institutions, wherever such seedlings have grown, and with it any hope of achieving classless societies/socialisms/communisms. It is not my view that representative institutions cannot exist within and between socialist /communist communities and societies. Rather my view is that representative institutions must remain subordinate to limited / human /community / workplace scale assemblies and institutions if democracy and socialism are to survive and flourish. Leninism at its best–to the extent that such a thing can be said to have existed anywhere outside of theory– subordinates direct democracy to representative bodies that are sometimes deemed to be democratic but, of course, as we know all too well from the real world examples of its liberal form, representative democracy is an oxymoron unless direct democratic institutions exist and are strong enough to ensure that representative bodies’ powers are strictly limited. I continue to hold the view that Sharzer’s attack on the local that is exemplified by the catchy but unfortunate title of his book, is equivalent to saying no to democracy and to socialism, which can only take root in local communities where real solidarity must begin. I continue to maintain the view that focusing firstly on the seizure of power at the national or transnational level in a Leninist fashion inevitably leads us away from socialism and democracy even in the unlikely event that the seizure is successful. Thanks for the review, I really enjoyed it and think it’s quite an accurate assessment/critique. If I can respond briefly to John’s points, I entirely agree that local communities are key in the fight for democracy and socialism. But that fight can’t end there, and (perhaps where we differ), it must scale up regionally, nationally and internationally. That requires some sort of extra-local political organization and a confrontation with capitalist state authorities. I would call it Luxemburgist before calling it Leninist, but that may be semantics. I wasn’t aware of Ribo’s work, and I have to say it sounds close to model-building. Those are useful – I also like Parecon and libertarian municipalism – but the concept of a closed, defined cultural space is limiting. Resources and people have always crossed boundaries, and setting arbitrary ones risks a right-wing localism that No Local mentions in its critique of Schumacher. Friendship and community are wonderful values to share, as long as they’re not exclusive.